I first heard of Graceful Stitches through Jason. He has a patient whose mother is an avid knitter, and when he told her that I was as well she told him all about her involvement with Graceful Stitches. I contacted them about being a volunteer knitter, and a week later a kit arrived at my house! 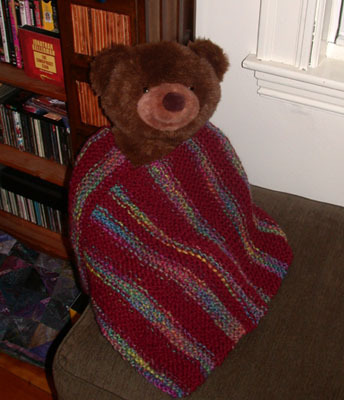 The kit was for an adorable kid's poncho, which I worked on occasionally between holiday projects. As Alison mentioned in her post today, once I finished up the poncho pieces I turned the pattern page to find instructions for an adorable matching hat. The only problem? It's a crochet pattern, and we don't speak crochet here at Casa Gringa. Knowing Alison's enthusiasm for charity knitting, I asked her if she was interested in making the companion cap. She finished it up this week, and I can't wait to reunite the two and send them off to Graceful Stitches! *Growing up, we had Windsor the Christmas bear. Every year, Windsor is set up with one family member's presents on Christmas morning. Two Christmases ago, for example, Windsor greeted us leaning against my mom's new computer with a spindle of CDs on his lap, and an optical mouse in his paw. When I moved out, my Mom Windsor got me my own Christmas bear so I could continue the tradition.